Resonating Bodies’ integrated media installations illuminate aspects of Canada’s biodiversity through focusing on pollination ecology, with special attention paid to the intersection of native bees, habitat and coevolution of plants and pollinators. Conceived by Sarah Peebles in collaboration with a number of artists in various disciplines, and with several Canadian and American bee biologists and researchers in related areas, Resonating Bodies began in 2008. Projects thus far include Bumble Domicile (2008) Amplified Habitat Installations for Wild Bees (2009 onward), and Odes to Solitary Bees (2010-2011). Bumble Domicile highlighted distinct features of bumble bees – Canada’s native bees which are social – through observation of the physical world, visual and audio transformations, scent, touch and genetic and other biological information. Solitary bees were introduced through playful and informative trading cards, included as a means to contextualize the larger world of wild bees. Bumble Domicile coincided with the release of Toronto’s first guide to native bees, “A Guide to Toronto’s Pollinators”, written by Laurence Packer, Professor of Biology at York University and published by the David Suzuki Foundation. The theme of the booklet — some 23 genera of bees found in Toronto — is woven into the fabric of the installation on several levels, and included talks on related topics by collaborating researchers Laurence Packer, Jessamyn Manson, Peter Hallett and Stephen Buchmann. Amplified Habitat Installations for Wild Bees provide an accessable window to the public to enhance our understanding and appreciation of our local pollination ecology. These are permanent installations which provide nesting habitat and shelter for wild, solitary bees and wasps while allowing the viewer to watch and listen to their activities from the ‘inside’, up close. 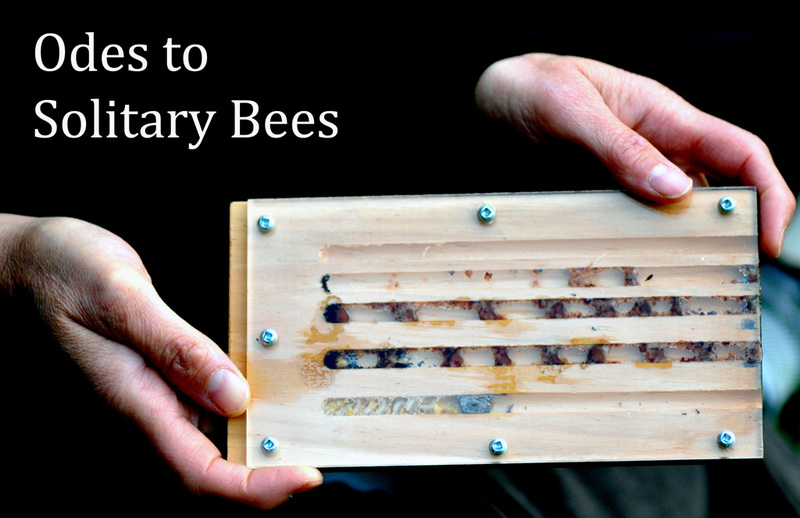 Odes to Solitary Bees combine ‘video poems’ and actual poems. Wild, solitary-dwelling bees of Toronto create nests, manipulate pollen, and hang out in the “Audio Bee Booth” as documented at a macro visual – audio scale. Artists to date include Sarah Peebles, Rob King, Rob Cruickshank, Anne Barros, Stephen Humphrey and Chris Bennett. Projects have been assisted by Kevin Steele, Anneli West, Gene Threndyl, Michele Bakic and the Flower Anther Swabbing Team, Kat Cruickshank, Rob Cruickshank, John Kuisma, Patrick Ellard, Nick Stedman, Danny Villneff, Lincoln Best, Amro Zayed, Barcode of Life Data Systems and Stephen Humphrey. Collaborating and advising researchers have included Laurence Packer (York University), Jessamyn Manson (University of Toronto), Peter Hallett (University of Toronto, the ROM), and Stephen Buchman (University of Tuscon, Drylands Institute, Pollinator Parnership). Additional consultants include Peter Kevan (University of Guelph and CANPOLIN), James Thomson and Michael Otterstatter (University of Toronto) and Cory Sheffield (York University). See front page for more credits.